Back by popular demand! Four new designs for you to stitch out and sell or give to those hard to find cool stuff for people in your life. 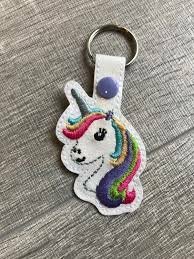 We will stitch a motorcycle, a unicorn, a bunny, and a glittery flower. These are so much fun and come to life when you play and switch up the vinyl colors and threads. We have the snaps and presses ready and waiting for you to complete these easy and quick designs with us! Bring a flashdrive to claim your designs!